After the 2005 season, Brees was not re-signed (partly due to the injury suffered in the Denver game) by the Chargers. Instead he signed a large contract that included sizeable guaranteed money with the New Orleans Saints, during the 2006 free agency period. Many[who?] doubted the Chargers' decision to change quarterbacks as they were a Super Bowl contender, believing that Rivers' inexperience would hinder them. Rivers was named the Chargers' starter going into training camp. 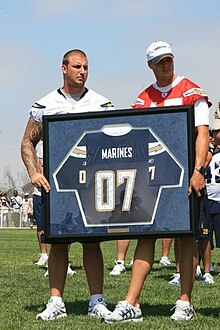 Expectations were high for Rivers due to the large amount of talent on the San Diego Chargers' offense and the performance of his peers from the 2004 draft (Eli Manning and Ben Roethlisberger) as starters. ^ "Divisional Round – San Diego Chargers at Pittsburgh Steelers ��� January 11th, 2009". Pro-Football-Reference.com. Retrieved January 12, 2018. ^ a b c "Norv Turner, A.J. Smith fired". ESPN.com. ESPN.com news services. January 1, 2013. Archived from the original on January 2, 2013. ^ "Los Angeles Chargers beat Oakland Raiders, miss playoffs". UPI. Retrieved 2019-03-22. ^ "Philip Rivers sets completion records against Arizona Cardinals". Touchdown Wire. 2018-11-25. Retrieved 2019-03-22. ^ "Walter Payton NFL Man of the Year to be announced Feb. 4". NFL.com. National Football League. January 22, 2012. Retrieved September 12, 2016. 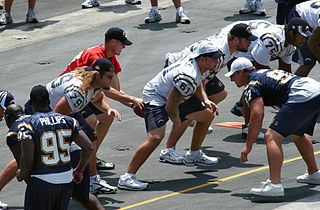 Wikimedia Commons has media related to Philip Rivers.